> CC News > Qixi Festival in China – 七夕快乐! This year, China will celebrate the Qixi Festival on August 20, 2015. 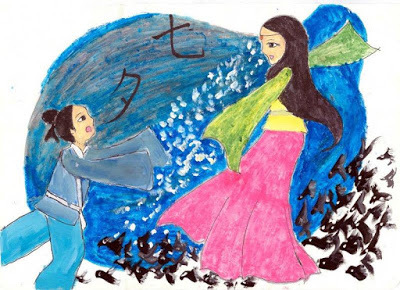 Qixi (pronounced Chee-she) is the Chinese equivalent of Valentine’s Day, or the holiday of romantic love in the United States, and it honors the true love of Zhinü and Niulang. 七夕快乐 translates to mean Happy Qixi in Chinese. Once upon a time, there was a young girl named Zhinü who symbolized the star Vega. She escaped from heaven in search of fun and adventure. Before her mother, the Queen of Heaven, noticed that her daughter was missing, Zhinü fell in love with the mortal Niulang. Zhinü and Niulang married and had two children together before Zhinü was ordered to return to heaven. Niulang was very upset that he was without his wife, so he skinned his ox and wore the coat in the hopes that he would be able to reach heaven. Niulang did reach heaven with their two children and became the star Altair. However, the Queen of Heaven noticed that the forbidden lovers were reunited and became angry. She removed her hairpin and scratched a river in the sky to separate them, forming the Milky Way. All was not lost for the two lovers, for they can still meet once per year on the 7th day of the 7th month in the Chinese lunar calendar when all of the magpies fly into the heavens and form a bridge to unite the lovers. Thus the holiday is also known by the name “Magpie Festival” or “Double Seventh Festival”.